"My grandmother used to care for the Masons. Mr. Mason was a pioneer in the roadside food industry. He owned cafes in Kansas, Oklahoma, Missouri, and Arkansas that served chili and apple pie. He kept his chili recipe secret for decades. He lived to be 107 years old, and my grandma finally got his recipe." 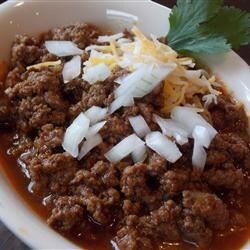 Place the ground beef and half the chili powder into a large saucepan over high heat, and cook until meat is browned, breaking the meat apart into crumbles as it cooks, about 10 minutes. Mix in the onion, and cook and stir until onion is softened, about 10 more minutes. Stir in garlic, and cook until fragrant, about 2 minutes. Stir in remaining chili powder, cumin, oregano, tomato paste, and cocoa powder, and cover pan. Reduce heat to a simmer, and cook until meat is tender and flavors have blended, mixing enough water to make a thick chili, about 1 1/2 hours. Stir occasionally. Mr. Mason served his chili spooned over pinto beans that were cooked with ham hocks. He insisted that you had to use Gebhardt Chili Powder. He died in about 1965. I have used the same recipe, substituting game, pork, chicken, and turkey for the beef, with excellent results. Thank you Jeff I remember eating this as a child in OK. Can't wait to try it. But I'll have to search for the chili powder!